Test Dpc Frp Bypass is not a piece of cake for an ordinary user. You may face a lot of problems while Bypassing the Factory Reset Protection manually. This makes Bypassing Factory Reset Protection a long process but what if I tell you that you can Bypass the FRP of your device by a simple method. If you were looking for the simplest, easiest and most convenient method to unlock/bypass the FRP on your device, then you are at the right place. Today, we will be taking a look at how you can easily unlocked or bypass the FRP on your device by the help of Test DPC frp bypass. Test DPC is a simple tool which helps you to bypass the Factory Reset Protection of your device easily without any hassle. You have to provide all the permissions of your device to Test DPC in order to unlock the FRP. There are various versions of Test DPC available for devices but we will suggest to go for the latest one because many bugs and errors are now solved with the latest version of Test DPC. How to Unlock/Bypass the Factory Reset Protection using Test DPC? There are two methods which can help you to Unlock/Bypass the Factory Reset Protection using Test DPC. Both the methods are mentioned below. Step 2– Install Test DPC bypass and open it. Note:- Make sure that Unknown sources under system setting are enabled. Step 3– After opening the Test DPC application, select the “Setup-Regulated profile” and proceed by clicking next button. Step 4– After that, click finish. Step 5– Once you clicked on finish, press the power key to jolt the screen and press afresh. Step 6– Now, go to select settings by tapping on the system icon and drag the screen from the best side. Step 7– Second last step is to go to the system settings and enabling the developer Mode. You can enable the developer Mode by tapping the build number of your device several times in the settings. Once, you enable the developer Mode, you will be able to see developer options under your system settings. Step 8– The last step is to enter the developer options and select OEM unlocking. Now, finish a factory reset of your android device. This was the first method which can help you to unlock the FRP of your device without any hassle but if you are not comfortable with this method because of any reason then you can go for second method which can also unlock the FRP of you device. We will recommend you to investigate both the methods before using anyone of them. Both the methods can be used to unlock Test Dpc Frp Bypass. Now, let’s go ahead and talk about the second method which will help you to Test DPC bypass APK. The second method is pretty much identical to the first method. In the second method, you actually have to encrypt your smartphone. Both of the methods get the job done without any problem. Step 3– Now, once you have successfully installed Test DPC APK on your android device, the next step is to Select the option which says “Set up device proprietor”. Step 4– Proceed to the encryption process of your android device by clicking the Next button. Note- The Encryption process requires at least 90% battery so make sure that the battery status of your device is 90% or more than it. Step 5– Once the Encryption process is completed, switch on your smartphone. These are the two methods which can help you to Test Dpc Frp Bypass and unlock the factory reset protection on your android device easily without any problem with the help of Test DPC bypass. You can use any of the mentioned methods to unlock the FRP of your android device because of this methods work exceptionally well. It is upon you to choose any of the mentioned methods. You may have also noticed that most steps are the same in both the methods. Test DPC is a great application to unlock the FRP of your smartphone. It is way better than doing the same thing manually. Using Test DPC, you can unlock the FRP by an easier method and it will also save a lot of time. So, you should definitely use Test DPC bypass to unlock the factory reset protection of your android device instead of doing the same process manually. So you are into making applications and you have made your own web application and now want to convert your web application into android and IOS based applications? It’s the year 2019 and India is reaching a pinnacle in digital infotech and there are thus many more opportunities that are increasing steadily. With the rise of new applications on Android devices, it is giving new developers to enter the market and directly target the big players. With the help of various software’s and application compatibility, it becomes easy for the developers to check their application before sending it out to the people for public usage. Since Android is a young operating system it has a lot of potential in it and thus developers are making good use out of it. Google Play Store is a platform in which developers and publish their either beat based applications or either fully published ones. This creates efficiency as nowadays even Android has started producing applications that help emulate an environment to support developers with their apps. You have tons of developmental apps on the play store made by various developers and this is because of this widespread revolution. App development can now be very affordable especially in the Android field as now Android developers can download free or very cheap applications that help them to test out their applications and help them to understand what is wrong within their apps or what is the problem and can help them to fix it with ease. 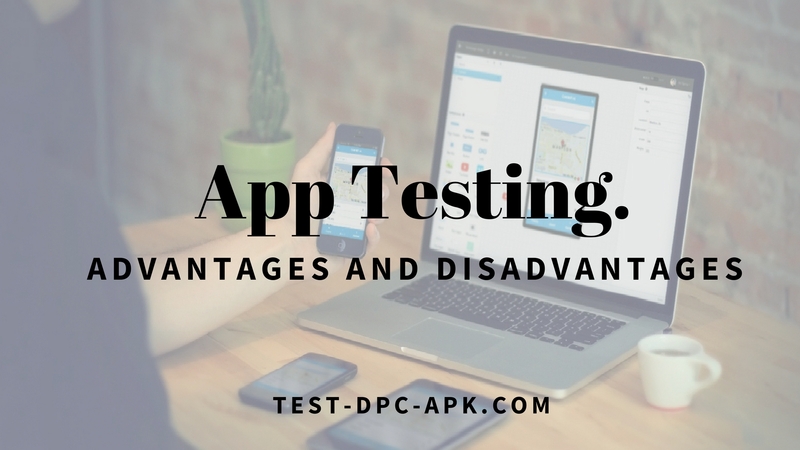 Most of these applications like Test DPC Apk are found on the Google Play store itself and are very popular amongst Android developers. In this way, app testing has taken a big turn in the industry as its ironical to use an app to check another app. That’s not the lease nowadays applications are also built to keep track of all the processes running on the user’s phone and alert the administrator of the usage made by a certain application. Even large companies use this to keep a track of its employees on what type of apps and about their usage. The apps like Test DCP allow the user to achieve this with ease and can keep the administrator in power. Also, these apps come in with group managing so every person can analyze the applications in power. Why should one test their apps before publishing? The answer is simply that the user should know how his/her app performs when it is published on the Google Play Store and should not have any bugs or errors that may disturb the usage and may cause dismay to the users of that particular APK. Also, another answer can be to make certain changes from specific Android-based environments and to get the desired output required on an Android platform to run on. Many App testers come with this feature to help the user modify the source code and help the application run in its natural environment. This thus helps users understand the behaviour of the beta APK. Speaking about the advantages of app testing is one too many as when some developer tests his application before publishing it. He eliminates chances of finding any bugs or errors that may be there in his/her APK. Another advantage can be that the developer comes to know how his app will perform ad what changes he can make in future updates to his/her clients. Testing an APK before publishing is always a good idea and keeps the developer at a safer side. Now coming to disadvantages about app testing. Firstly, too much of something is not a good idea. Also, his APKs main idea may ultimately change leaving him with no future updates to offer to his users the next time. Thus, both sides have their advantages and disadvantages of testing APKs and publishing them on the Google Play Store for the mass use.